Rajinikanth Film Review From Veera. Veera Movie. Rajini Film Veera. Rajinikanth Veera movie. www.rajinikanth.com. The movie starts off with Rajni coming to the city from his village and winning, along with Senthil, a song contest organised by Janakaraj. He then tells Senthil about his reason for coming to the village - to repay his mother's debt to another villager. He was also in love with Meena and was going back to the village to wed her. But he learns that the village had a flood in which Meena died. He returns to the city and weds Janakaraj's daughter Roja who is in love with him. But Meena, who was rescued, turns up and Rajni has to act as two people, Muthu and Veera, to tackle them. The truth comes out in the end and Rajni falls into the villain's trap but escapes and establishes the truth. 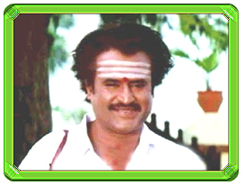 A hilarious film that exploits Rajni's comic talent to the full extent. Rajni excels in the scenes where he tries to catch the eye of Meena by learning singing under her father and later when he acts as the husbands of both Meena and Roja. Senthil lends able support. Has some robust fight sequences too. Ilaiyaraja comes up with some great songs.